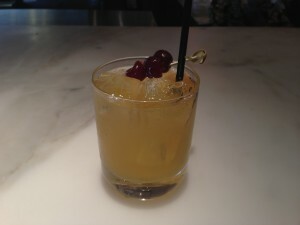 I’ve always had my reservations about the Whiskey Sour (I’m talking about a proper cocktail, not whiskey with sweet ‘n’ sour mix). That said, bourbon greatly benefits from a pairing with vanilla. And I found that the use of vanilla syrup rather than the standard simple mellows out the off-putting tang of the lemon and whiskey. However the drink still fell a little flat, until I added a dash of sunshine. While I didn’t invent sunshine bitters, I was extremely pleased with the results once I made them. They’re a wonderfully strong combination of cardamom and saffron infused in high-proof alcohol. And they have a lovely, bright color from the saffron. In this drink the cardamom plays so well with the citrus. And the saffron adds a smooth silky flavor that goes a long way. Thus the Bluegrass Sunshine was born. Shaken and served in a rocks glass over ice. Garnish with brandy cherries.